Inder Loves Folk Art: New toy! Look what mama got for Christmas! It's an overlocker! (Yes, it's pretty much the cheapest one on the market. But it gets good reviews. Like everyone else, Santa is on a tight budget these days.) I am so excited to get this going! I have done pretty well without one, but it was time to step my game up a bit. I will be able to sew knits with more ease now, and the clothes I make will be so much better finished on the inside. Now that I've (sort of) cleared a space for it, I need to figure out how it works. Like all sergers, this thing is a beast to thread. If you don't do it exactly right, and in the right order, it just doesn't work. So I opened the owners' manual, hoping to find a helpful threading guide. 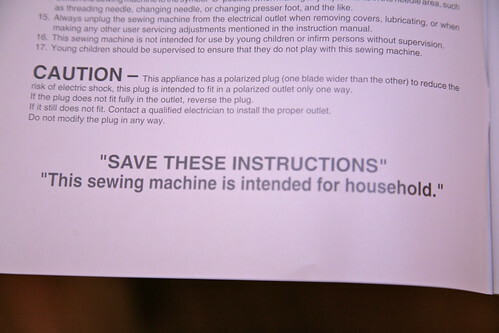 Instead, I was accosted by some wildly inappropriate quotation marks. Now, I'm hardly a model of perfect grammar and syntax (snort), but when I saw this, all I could think of was Dr. Evil and his air quotes. Or Joey and his "apology" on Friends. Do you mean "household use"? Super distracting. Super, super distracting. I try to read it, but seriously, I can't get the image of Dr. Evil out of my head long enough to learn anything. And the whole manual is like this. With inappropriate quotation marks in five different languages. And hardly any pictures. Well, I'm nothing if not good at following instructions. 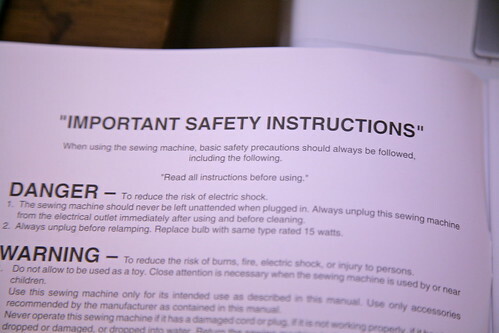 The manual said "'Read all instructions before using.'" So that's exactly what I did. I (open air quote) read (closed air quote) the instructions. In other words, I tossed them aside in disgust. All I can say is, thank goodness for YouTube instructional videos. I mean, seriously, what did we do before YouTube? The mind reels! 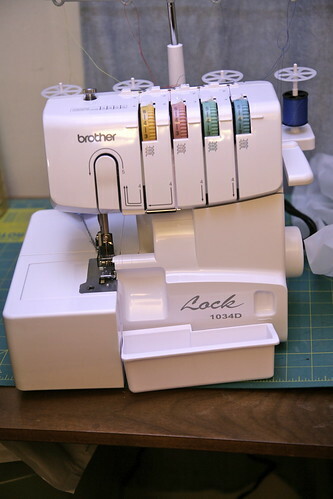 I'll admit that the internet has not improved my hypochondria; it has, however, vastly improved my sewing life. End result: After rethreading this thing for the third time, it is actually stitching! Beyond that, I have no idea what I'm doing, but I am past the first hurdle. 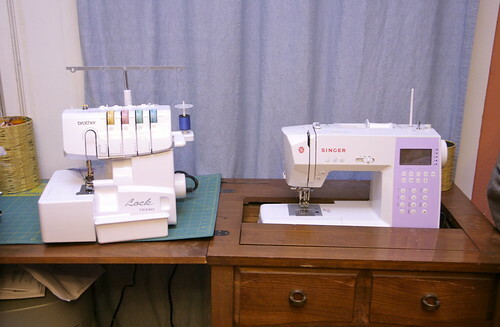 And luckily there are more YouTube videos to help me learn how to actually sew with this thing ... back to my studies! Yay! Oh once you get it going well you'll never look back. Well, "never look back"! Mine is an old Singer which is really basic and does nothing special and is totally manual threading, but I'm mostly "friends" with it and use it heaps and don't really wish for anything more "fancy". Does yours have a "threading diagram" inside the "looper cover"? And "colour coding" on the threading parts that correspond to the "tension discs"? If so I find that the best way to figure out the threading. so exciting! I have the same one and so far so good. i don't expect it to last for too long, but for now it gets the job done. I hope you "love" your new server. Mine spent about "a heart" in the box before I was brave enough to attempt threading it. I'm the end, threading it went fine, but getting "correct" tension took FOREVER! Here's to beautiful serged edges!